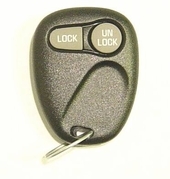 Chevrolet C/K Silverado key fob remote replacements! Need to replace your keyfob for your Chevy Truck? CK1500, CK2500, CK3500 keyless entry remotes are a very easy to program with free instructions available. Remote control transmitters for C/K full size Silverado trucks are simple 2 button, lock and unlock key fobs. Free do it yourself programming instructions and tech support with every order.